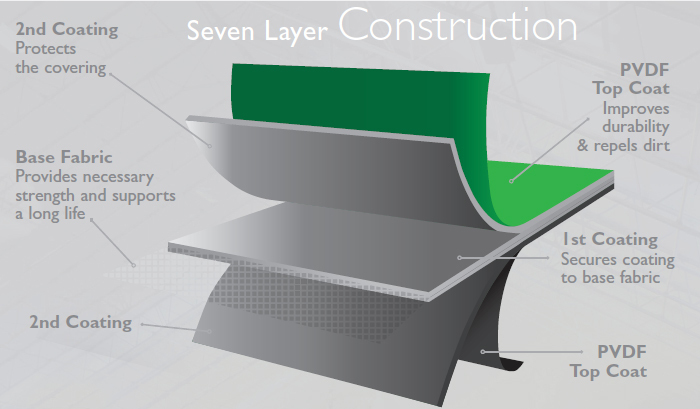 A Hercules Truss Arch Building is the pinnacle of strength and durability, and it all starts with the materials. ClearSpan fabric structures utilize a USA-made, triple-galvanized structural steel frame that is corrosion resistant and features an industry leading 50 year warranty. The frames are covered by 24 mil rip stop polyethylene. The fabric cover has a rip-stop weave that prevents tears, is 100% recyclable and features an industry leading 20 year warranty. ClearSpan buildings can be engineered to meet any of you regional building codes and weather requirements, and stamped engineered drawings are available upon request. The design of these buildings ensures that they can be built quickly – as much as 5,000 sq. ft. a day – and they feature wide open space. A Hercules Truss Arch Building features no support posts, so there is plenty of available space for operating machinery, working or storing. The Hercules Truss Arch Building utilizes energy-efficient design that can drastically reduce power consumption and utilities costs. The fabric cover provides ample natural daytime light through, providing a well-lit, illuminated environment that doesn’t feature any shadows. There is plenty of light to eliminate the need for artificial daytime lighting, and the nature of the cover allows the interior temperature to actually be cooler in the summer and warmer in the winter. Hercules Truss Arch Buildings have the ability to be built on a number of different foundations. Our Helical Anchoring System is a cost-effective option that limits building time and excavations costs. Helical Anchors drill directly into the ground, and while they are classified as temporary, they can be used as a permanent solution and never have to be replaced. A fabric structure from ClearSpan can be built on poured concrete, posts, blocks, containers, piers or concrete pads.